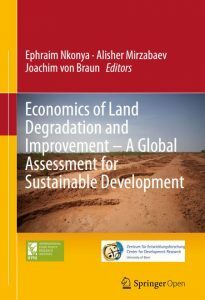 A policy seminar that happened last week at the International Food Policy Research Institute (IFPRI) in advance of the World Soil Day featured findings of a new book about land degradation, which is occurring in almost all terrestrial biomes and agro-ecologies, in both low and high income countries. It is stretching to about 30% of the total global land area. About three billion people reside in degraded lands. However, the impact of land degradation is especially severe on livelihoods of the poor who heavily depend on natural resources. The annual global cost of land degradation due to land use and cover change (LUCC) and lower cropland and rangeland productivity is estimated to be about US$300 billion. Sub-Saharan Africa accounts for the largest share (22 %) of the total global cost of land degradation. The results indicate that reversing land degradation trends makes economic sense, and has multiple social and environmental benefits. On average, one US dollar investment into restoration of degraded land returns five US dollars. The findings of the country case studies call for increased investments into the rehabilitation and restoration of degraded lands, including through such institutional and policy measures as strengthening community participation for sustainable land management, enhancing government effectiveness and rule of law, improving access to markets and rural services, and securing land tenure. This work was undertaken as part of and partially funded by the CGIAR Research Program on Policies, Institutions, and Markets under the research flagship Property Rights Regimes for Management of Natural Resources and Assets.